As most of you know, the SOS management (SOS Children's Villages) from Tegucigalpa forced the two SOS facilities that we had been working with to end their volunteer programs this past June. This was not because of anything that we or our volunteers had done and was an across the board decision for all of their Honduras locations. We had been hearing for several months before this decision that the Tegucigalpa management had been visiting other SOS locations (not where we worked) and that several directors had either left or been fired. Specifically, an experienced and beloved director in San Pedro Sula had been forced to quit and now we have heard that the Tegucigalpa director has put in his resignation. It is hard to know exactly why this is being done but we suspect that the new management group in Tegucigalpa sees this as a cost cutting measure and also has a desire to put their own "people" in place but we really do not know for sure. The reason that I am writing is because our friend Olman Flores, the director at El Pino has been forced out along with four of the madres. The effects on Olman, the madres and especially on the children, are devastating. Here is what we know so far. Even though we no longer have volunteers at SOS, Rikke and I were invited by Olman to visit and so I called Olman to find out when would be a good time to come. As soon as he answered his phone I knew that something was wrong but he was not able to tell me so I told him that Rikke and I would contact him to hopefully see him the next day. Rikke then called the next morning to let him know that we were coming and he then told her what had happened to that point. The SOS management people had required Olman to take a "vacation" from June 15-30 while they ran the facility and audited operations. When Olman returned at the end of June, he was not given any report or told of any problems to correct. As some of you know, most of the madres are from the southern part of Honduras and do not have family along the north coast. These women had no money and nowhere to go. Eventually, one of the other madres who owns a home in the small housing development just west of SOS in El Pino, told them to go and use that house. Charlie and Amalia have brought them some food. Meanwhile, Olman and his wife had no other place to go except their son's home in Santa Anna (about 15 minutes west of El Pino.) 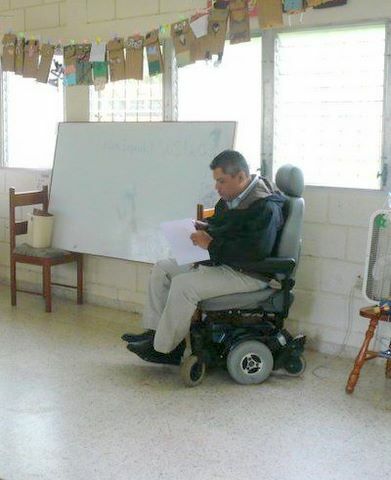 They were not allowed to bring very many of their personal items and in fact, Olman was not even allowed to bring his electric wheelchair and the Tegus folks still will not allow him or anyone back to retrieve it. Rikke and I visited Olman on the 11th and then again a few days later. As you can imagine, Olman is very distraught and is especially worried about the effect that these events are having on the children. The children at SOS look at the madres as "mothers" and to many, Olman is like a father. Imagine the loss and fear that they are experiencing as their loved ones are being sent away with no explanation or time to say good bye. Many of the children are running away and trying to see the madres and Olman. They are scared. Rikke and I saw SOS children hitch-hiking on the side of the road as we returned from Santa Anna and Olman has a video of driving into La Ceiba and finding a 9 year old SOS boy at the side of the road. There are some allegations that have been made about Olman. One is that he disciplined a child by putting them alone in a room without food or water for 3 days. For those of us who have spent extended periods of time at SOS and with Olman, we know that this is not at all how the children were treated but the scary part is that if these allegations force Olman to go to court, he could actually end up in jail. Allegations have also been made about the madres and even about Miriam who works in the office. This is just horrible and crazy. We want you to know that Olman has worked at SOS as a director for 13 years. Rikke has known him since 2005 and I first met him in 2004. 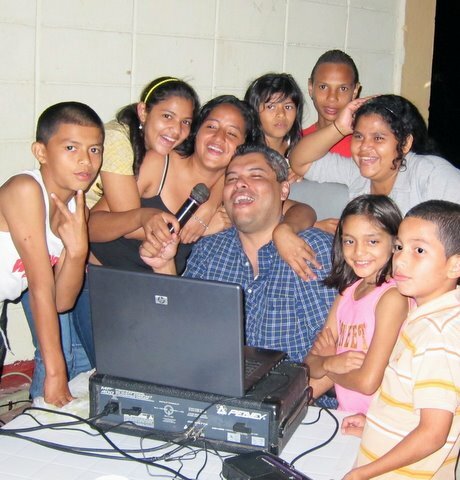 Olman is a kind and good man and IHNFA (child services in Honduras) has never had a negative report about him. The IHNFA people know and respect him. He has also never previously been disciplined by SOS in any way. There is NO HISTORY of any type of infractions. Rikke and I are worried about Olman but also very scared for the children. Even if Olman will never be able to return to his job, we need to make the SOS international office aware of what is going on and — here is where you come in — let them know that individuals and organizations from ALL OVER THE WORLD are aware of the situation, concerned for the emotional well being of the children and will vouch for Olman's character so these allegations are thrown out. SOS is based in Austria and so we would like to send emails to their main office but hard copy letters may be more effective. If you will write a letter on behalf of the children, the madres and Olman, Rikke can ask her father in Denmark to print it and mail it to Austria. BUT ALSO EMAIL THEM TO RIKKE (cc'd above). Please put "SOS Letter" in the subject line so she can find them easily. Please make sure they have an actual signature. • Write your letter in English but if you are able to include a Spanish translation, that will be helpful in using these letters to defend Olman in Honduras. • Keep your letter brief but heartfelt. • Explain how you know Olman and the children at SOS — note that it would be good to say that you volunteered with HondurasChildren to deliver an academic enrichment program to the children (or vacation care, art program etc.) SOS does not accept volunteers on their own so it's important to say that you were part of an organization delivering a free program — not that you volunteered directly for SOS. • Address your observations of the care and love that the children receive. • Express concern about the emotional welfare of the children who have had their mothers and Olman sent away. • Speak specifically about Olman's personality, demeanor with the children and his character. • Be sure that you list your contact information and are clear about what country you come from. We need these letters RIGHT AWAY — please let us know if you will help. Thank you — and sorry to have to bring you this sad news. Incredibly, the SOS management from Tegucigalpa threw these long-time live-in workers out on the street with no notice, no reasons given, no charges made, with nowhere to go and without even allowing them the ability to gather their personal belongings. Olman Flores is paralyzed from the waist down but was not permitted to take his own personal electric wheelchair! I am pretty sure that SOS has violated many Honduran labor laws and could be subject to severe sanctions and possibly civil lawsuits. Today's La Tribuna reports than the director of the SOS Aldea in Choluteca was charged with violation of a minor, which may or may not be true. Even if true in that case, it doesn't justify a mass "housecleaning" across the country in SOS's seven facilities of what are reported by many volunteers over many years to be good, honest, loving caretakers of the children. I've been told that the Choluteca director has been with SOS for 12 years with no problems and that some believe this charge is false. You can read some of the letters that volunteers have sent to the SOS organization in Austria at Honduras Children's Facebook page. I hope you'll take time to read some of them. The support for Olman Flores is very powerful. If you aren't on Facebook, one of the letters can be found at HondurasWeekly. SOS Honduras' new director has ousted all volunteer organizations from participating with the orphanages. I have been told that this same woman was director some four years ago and did the same thing back then — ousted all volunteer groups — and that she's now back in charge with a vendetta. She has fired the national director, and other respected Aldea directors were either fired or have resigned. One source within the SOS has implied that there are some illegal goings on within the Tegucigalpa SOS management. Whether all of this is a misguided effort to protect the children or a result of a power play, corruption, or crime, it is obvious that no consideration has been given to the traumatization of already at-risk children. We aren't talking about about protecting the integrity of sacks of beans! These children and teenagers are human beings who most need the stability of adults they can count on. One thing is certain and that is that SOS Children's Villages International, who have orphanages all over the world, needs to get to the bottom of this and take appropriate action before their reputation is permanently tarnished. Some factual information about what is going on would be a good start. In the La Ceiba court today at 10:15 a.m., Liz Riggs' attacker was found guilty of attempted homicide. The sentencing hearing will be held in about two weeks, but based on the penal code, he should receive between 15 and 20 years in prison. This verdict is a huge relief for Liz and the witnesses who were very fearful about what would happen if the attacker was released. He had been held in prison in El Porvenir since two days after the attack and was returned there today after the hearing. I'll be writing more about the trial after the sentencing hearing. Whether you call them kebobs, kabobs, kababs, shish kebab, brochettes, or pinchos as they are called in La Ceiba, Honduras, meat on a stick is an easy and quick, but impressive meal. Pinchos of beef, chicken or shrimp are a popular restaurant meal in La Ceiba and are simple to make at home, too, either by grilling outdoors or broiling in the oven. The variations are endless with any type of meat, vegetables, and flavorings. Oh, to add one more name to the list, one former restaurant in La Ceiba called them 'alambres' (wires) referring to the skewer. If you don't have access to your own kitchen, I recommend the pinchos at Expatriates Restaurant here in La Ceiba. El Jefe would opt for beef any day but one of the many nice things about pinchos is that it isn't such a big deal to prepare more than one type of meat in the same meal. My personal favorites are chicken or shrimp, especially when I can combine them with fresh pineapple and lots of chiles. As one of the Blogicito commenters mentioned recently, the local La Ceiba pineapples have been just out of this world in rich flavor during the past few months. I always love fresh pineapple but apparently the weather has been absolutely perfect lately for developing sweet, juicy, flavorful pineapples. No matter how green or yellow, how big or small, all have been outstanding. I like pinchos for parties because depending upon the crowd, people can prepare their own with the ingredients they like best. There are usually some who enjoy the cooking especially when it is outside on the grill — man territory. I think it is fun and it's good to take the pressure off the ladies for a change. Here is a tip I learned from Martha Stewart: If you use wooden sticks, soak them in water for an hour or two prior to assembling the kabobs to prevent the tips from catching on fire. Here is a tip I learned from Gordon whats-his-name, the British chef/restaurant saver: Never reuse wooden sticks. Throw them out as they could contain bacteria and he might have to come and close down your kitchen. These shrimp pinchos included chiles, onions, and tomatoes, just what we happened to have on hand. Since it only takes about 5-7 minutes to cook the shrimp, you wouldn't want to use any vegetables that need a longer cooking time. El Jefe had more onions on his pincho, but he thought the onions had a too-raw taste. The next time, I think I'll saute the onion pieces for a couple of minutes before assembling the pinchos. I've done that in the past, but didn't think about it this time. Here is the 'secret' marinade I used: Lee Kum Kee Marinada de Pollo Teriyaki, available at most of the grocery stores in La Ceiba. I use this a lot, straight out of the bottle, including for Tex-Mex chicken or beef fajitas! I discovered it one of the first times I tried to make fajitas in Honduras and of course didn't have my favorite smoky fajita marinade from Texas. Out of desperation to pump up the flavor, I tried some of this marinade (Chinese-Tex-Mex?). It was surprisingly good, and surprisingly not so oriental-flavored as I expected. Just go easy on the salt in your recipe as this packs a heaping serving of salt. We served the pinchos with steamed jasmine rice (YUM — what aroma and flavor! ), and since we can never get enough pineapple, a fruit salad. Yesterday the Supreme Court of Honduras granted admission of Federico Álvarez's petition for recurso de amparo (appeal for legal protection?). Meanwhile Minister of Interior Áfrico (the Witch-Hunter*) Madrid's decree revoking Álvarez's naturalized citizenship is suspended. The case will be heard by the Constitutional Court. To refresh your memory, in 2009 Sr. Álvarez was granted honorary citizenship for his services to the country of Honduras. He later applied for and was granted official naturalized citizenship by Madrid's predecessor in January 2010. He has lived in Honduras for more than 30 years. Álvarez is married to a Honduran and has raised his Honduran children and grandchildren here in Honduras. Over the years he has been decorated by two different presidents with two of Honduras' highest honors. But Álvarez fell out of favor with the current Lobo government because of his critical opinion pieces in La Tribuna newspaper, and in fact was warned by mutual friends to "cool it" because he was making Pepe very angry. 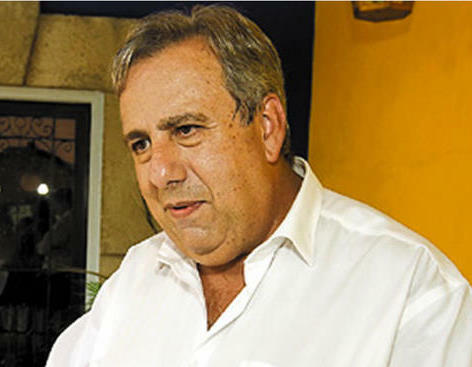 In a purely political motivated move of intimidation, his citizenship was quietly revoked in October 2010 and he only learned about it after Madrid gleefully announced the action on a Resistance radio program, not even giving Álvarez or his attorney the courtesy of an official notice or the opportunity to correct any alleged paperwork deficiencies before making the embarrassing public announcement and the not-so-veiled public threat that "Álvarez might be invited to leave the country in the next few days". One of the supposed deficiencies was a missing police report from the "home" country. Given the fact that Sr. Álvarez originally came to Honduras as Costa Rican Ambassador in 1977 and has lived and worked in Honduras as a legal resident for more than three decades, common sense might tell you that a clean Honduran criminal report covering the past 34 years should suffice. This whole embarrassing situation should be, but doesn't seem to be, a huge concern for this administration at a time when they are desperately trying to attract new business to Honduras through the 'Honduras is open for business' and Charter City campaigns. The best thing they could do is to admit their mistake and drop the issue with a public apology to Sr. Álvarez. Unfortunately, this government seems to naively believe that savvy international businessmen are as uninformed and easily fooled by empty promises as the voters are. How would potential investors feel about the possibility of having their citizenship or residency revoked or being threatened with ousting from the country if they dare to express critical opinions? That's not a risk that most would be willing to take, I'm sure. Potential investors also need to know that, despite what is currently being said to the contrary, the wind blows in a different direction with each administration, and that laws are mere suggestions in Honduras. Although freedom of speech and thought is a universal human right according to the United Nations, most of the foreign residents in Honduras that I know are already intimidated from speaking their opinions publicly (many have told me so) for fear of government interference in or retaliation to their businesses, NGO's, or charity groups. Most Honduran bloggers outside of the Resistance do not write about political matters. How many more citizens have thought twice before expressing an opposing opinion? Honduras needs more citizen participation, not less. And it could just be that those who haven't been blinded by a lifetime of being beaten down by corruption and government incompetence might have some views worth listening to. * Africo Madrid is still at his witch hunting. That's not to say that these groups don't deserve to be shut down. Many of the them are merely con artists who defraud the poor and ignorant. But when I think about all the "legitimate" businesses who cheat their customers on a daily basis with untruthful statements, shoddy goods, and rotten food while strictly maintaining their no refund, no return policy, I can't help but wonder why he doesn't focus on issues that would protect and benefit more of the population. I have a backload of literally thousands of photos. Looking through them the other day, I realized that part of what has been holding me back is feeling like I need to know the official names and must be able to tell you everything about the plant or thing or place. I'm going to try to put that aside and let you readers tell me more if I don't know. In this case, however, I was able to find this fruit in my book, Frutales y Condimentarias del Trópico Húmedo (Fruits and Condiments of the Humid Tropics) from CURLA, the agricultural university here in La Ceiba. Neither El Jefe nor Arexy were any help at all. It turns out that this is a cactus fruit! This photo of the night blooming cactus (Hylocereus undatus) is from Wikipedia. It is native to Mexico and Central America. If you are interested in growing fruit trees or other fruit plants in the north coast of Honduras, I highly recommend this book (in Spanish only). One review calls it a "A bible for any tropical fruit enthusiast".It can be purchased for around $20 at CURLA, and while you are there, you can buy several types of small fruit trees and a few other plants for around L. 20 each (about US $1). I haven't been there in quite awhile but we were able to get some good info as well as a tour of their trial orchard in which we were able to get a better idea of what the full grown trees would be like. For each of the 150 or so fruits covered, the book has a page of photos of the plant, blossom, fruit, and full grown tree and another page (sometimes two) of information, including the scientific and common names, the origin of the plant, description, preferred climate and soil type, propagation, planting and management, recommended varieties, age and length of time for production, the season and quantity of harvest, and the insect and disease problems that may occur. My only quarrel with the book is it's organization. Even the index is not in alphabetical order, making it very difficult to look anything up. So beautiful it's hard to believe the color is natural! Anyway, back to the pitaya roja. El Jefe bought it at the market at the recommendation of the vendor, who said it made a delicious juice and that one fruit would make a large quantity of juice. Neither J nor Arexy had ever had it before. 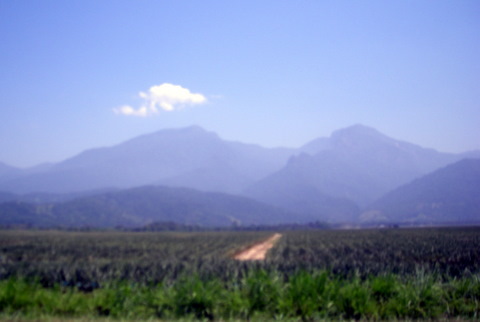 The book says that it is not cultivated in Honduras, but that the fruits are sometimes gathered and sold from the forests. The fruit can be scooped and eaten from a spoon, seeds and all. Some of the common names for the fruit are Pitahaya (Colombia, Venezuela, and Mexico), Flor de Cáliz (Puerto Rico), and Reina de la Noche (also Mexico). In English, I found that it is sometimes called Dragon Fruit or Strawberry Pear. A white-fruited variety may be more common, and Fruits of Warm Climates indicates that this red variety is actually H. ocamponis Britt. & Rose. Upon cutting it open, we were surprised to see the almost beet-like interior — beet-like in the finger staining aspects as well. The fruit was much softer than I expected and full of small black seeds. Arexy mashed and strained the pulp through a sieve to remove the seeds, and then used the blender. She added a little sugar and water. She made almost a half-gallon pitcher of juice from this one fruit. We thought the flavor tasted a little bland even before we made the juice, but that may have been because we kept it around for a few days before we made the juice or maybe Arexy added too much water based on the vendor's claim. But the vibrant color made up for the flavor! What a beautiful drink. We found the flavor was improved with the addition of a little lemon juice. Would I try it again? Definitely. But only if it is available in the market; I won't be growing any spiny cactus here. We somehow missed the great garden clean up of 2010 and in this tropical climate, things can get really out of control during that period of time. You can click these photos to enlarge them a little. We bought one of these plants in, oh, say, 2007. This photo was taken in 2008. We moved some of the babies and now have several of these accent plants in different spots in the garden. I love the white and grey-green spiky contrast with so much green in the garden. 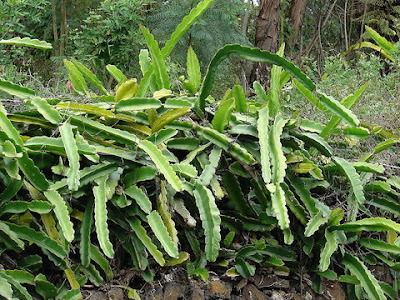 These plants are totally carefree, never bothered by insects or too much or too little rain. Though they multiply, they are easily controlled and you can't beat free plants, can you? Anyone know the botanical name? I think that one of the hardest things about tropical gardening is imagining how much space the little 6-12" plant you are looking at will need in the future, especially if it is one of those plants that doesn't like to be lonely and turns into 37 plants by the next year. I couldn't resist these wild multi-colored plants — more accent colors! At the time we bought them they were maybe a foot high and now the tallest Ti plant (Cordyline terminalis, totally out of control) is about 16 feet tall or more. Now these colorful overgrown crotons seem a messy hodge-podge, so we want to cut them back and take some cuttings to plant in other locations where their wild colors and leaf shapes will shine through more and maybe, just maybe, we'll keep on top of the pruning tasks a little better in the future. Cuttings and starters from tropical plants are very easy. For stemmed plants, generally all you have to do is chop off the top, stick it into the ground, and water well. We do that every year for these wild Dieffenbachias in the jardinera in front of the terraza. If we didn't, they would soon block the view and fill the whole jardinera. They don't miss a beat, not even wilting from having their head decapitated from their body. You can even cut the long bare stems into foot-long lengths and plant those. For those that grow from rhizomes like Heliconias, just chop off the plants at about a foot high, dig up some of the rhizomes, and replant them in a new area. Before you know it, you'll have another new clump. Can you see all the 'baseball avocados' hanging from the tree in the photo below? We'll soon see how bad was the mistake of planting two hybrid Hass avocado seeds. I'm really kicking myself for this. We are seriously thinking of chopping down one of the trees and replacing it with a better avocado from the agricultural university. This peachy-pink flowered Mussaenda philippica is another totally out of control plant. We wanted it to be a bush, but failed to keep up with the trimming, and it wanted to be a tree. After a rainstorm, too heavy with water laden blooms, it would sprawl about 15-20 feet inside the garden all over the lawn and outside all over the sidewalk. These can grow into nice tree shapes, but ours had too many stems and none of them strong enough to support the weight. 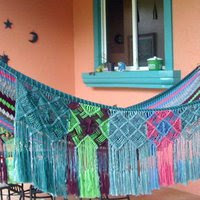 During the beginnings of the great 2011 garden clean up, El Jefe asked me what I wanted to do about it. I said that I hated to lose all those glorious blooms (it blooms year-round), but obviously we had to do something. He came up with the idea to just leave the parts growing in the avocado tree, so now the "tree" has support. Not many people have a pink-blooming avocado tree, do they? This Heliconia rostrata (Lobster claw) is another one where I bought one and now have several. Isn't that a spectacular bloom? Some of them are easily two feet long. It has had a hard life. When we first started landscaping the garden, one of my neighbors gave me several plants. While most were outstanding plants that I just love, one was a wild orange Heliconia that would take over the world if we let it. I have joked that the neighbor put a curse on our garden with that plant. This is the dreaded Heliconia from hell. If that sounds harsh, you should know that it spreads for miles and chokes out and shades out every plant it surrounds. We've spent five years trying to rid ourselves of every trace, every stem, every root, even to the point of sifting through the soil to find every little piece of root left behind. But it comes back and back and back again from the grave. At one point, this Heliconia latispatha had invaded the Parrot's beak area and out of frustration and unable to tell which plant was which without the blooms, El Jefe hacked it all back and pulled out all the roots that he found. I was disappointed, but thankfully, he missed a few roots and the good guy plant has returned. See also Unstoppable tropical plants for some of the lengths we've gone to to rid ourselves of some of the invasive plants. These Caladiums suprise me every year. They seem to completely die away during the dry season but then return with the rains every year. I found the red and white splotched ones growing wild and dug them up from the side of a dirt road out in the country. I like to be prepared and take some pruners and a little shovel when we go out for drives. You never know what you might see or what someone will offer to you. ;-) The larger solid green leaf is an elephant ear which actually has an edible tuber called malanga and which needs to go before it chokes out everything else. And by the way, I am not denuding the natural tropical habitat when I collect these plants. The sides of the road are usually macheted at least once or twice a year, so I'm actually saving the ones that I collect. I've always called this plant 'mother-in-law's tongue'. 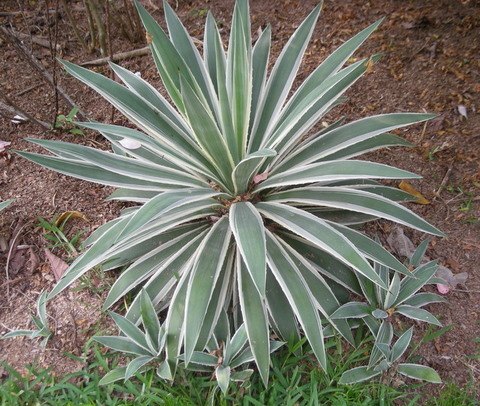 I had one in Texas inside in an 8-inch pot for so many years and it never grew or multiplied. I can't remember where I got this but I thought the thin upright spikiness would make a nice contrast to the other sprawling tropicals. It has taken off like crazy and we are thinning it out to a ratio of about 10-1. It's former accent clumps have turned into thick hedges. El Jefe found a good worker to help us with this mammoth task of garden clean up 2011. If I have my way, Josue's two week job may be closer to two months. "We" are also working on a humongous compost pile right now. (I'm gerente general of compost, so, of course, all I do is give orders. hahaha.) It is such a shame that more people don't compost instead of using chemical fertilizers. There is such an abundance of free natural materials that instead of being used naturally go to fill up the dumps and/or get burned or tossed into the creeks. Sometimes the materials even get bagged up and thrown out beside the roads. Even if you are dead set on purchased fertilizers, the compost is wonderful for potting soil and improving the texture and drainage of the soil. This photo doesn't do the quantities of compost material justice. On the left is sheep manure (no smell!) and on the right are the yard trimmings to date, with much more to go. In the rear of this photo, behind the green plant in the center are our three built-in compost bins. Though they are large, obviously all of this is not going to fit when we start layering it in. Between the mountain of trimmings, a couple of pickup loads of sheep manure, and three big trucks full of wood shavings, we are going to be rich in 'black gold' before long. That is Oso looking through the window screen wondering why Papi's favorite, Zoe, gets to stay inside while he's relegated to being a yard dog. Then he's joined by Joey, whose pitiful sad look works on me and inside they come. The dogs generally stay outside during the day and come inside when Arexy leaves at four. They've learned to tell time and know when it is 4 pm even on days that Arexy doesn't work. Just in case I don't notice the time, they gang up and remind me. Lately, El Jefe has frequently "accidentally" let Zoe inside during the day which gives her the idea that she is special and rightfully deserves the special treatment. At the first drop of rain, she cries like she is sure that she will just melt away if a single drop falls on her. At one point, the chicken coop was taken over by fire ants and the flock abandoned it for the railing on the terraza — not a good thing due to the mess they make. The rooster in the foreground is Pancho. He's still going strong as leader of the flock and you would never know from watching him that I snatched him from the jaws of death. He's almost indistinguishable from the other rooster, except for a missing spur and one of his long tail feathers which never grew back. Generally it is best to only keep one rooster (because of fighting and increased crowing to each other), but I wanted to keep the other one because he was a white chick and I was hoping that we would get some more "blond" hens. It hasn't worked so far. The normal Red Jungle Fowl look seems to prevail with few variations. But the roosters get along most of the time since there are enough hens to go around. The photo is deceiving because there is a hen behind the second rooster and it looks like her head belongs to him. ;-) If you look closer, you'll see that his head is bent down. I tried to get some photos of the hens but they would run away when I got too close. There are two chicks in these photos as well. For some better photos of these bantam hens, check out this article. The hens are constantly disappearing somewhere to nest and reappear after about 6 weeks with their chicks. In the meantime, we get no eggs! I suspect that Chloe is finding the egg hiding spots before we are and is eating the eggs. Chloe is about 8 years old now. She's a good dog except for her penchant for my eggs and a very good guard dog. She doesn't bother the chickens and mostly gets along well with the chihuahuas, though the boys have taken to growling at her sometimes when she comes into the house (their territory). She gets annoyed with that so I try to nip that in the bud. It's funny how chihuahuas don't see themselves as they are. They seem to imagine that they are Chloe's equal. Unfortunately, they have both found out the hard way that they aren't. I'll admit it. I've been a lousy blogger. Not to give excuses, but just to blog about what has been going on, I offer the following. Wondering how many times our car(s) can be hit by others before we ever get one dime of restitution (apparently it is more than eight). Semi-supervising a big garden clean up. Worrying about Arexy and what's going to happen to her children because she's pregnant again. Wondering when the water will come back, wondering why rich Hondurans think that it is okay for their neighbors to pay for their water usage, and wondering why our patronato lets them. Avoiding all news as much as possible and then worrying about what I'm missing. Wondering if a teacher can really throw a 4th grader out of school for the rest of the year and fail him because he is misbehaving. And wondering why the mother doesn't worry. Worrying about someone's residency status because she is in a big mess, precisely because she didn't listen to my advice and listened to a lying, thieving attorney instead. Feeling guilty about all the blog articles I've started and not finished. Worrying that my car which was wrecked in 2009 is still on the Honduran tax rolls and we can't get it off, even with an attorney and thousands spent on the task. Trying to maintain my integrity, to be an honest and responsible citizen, when it would be so much easier and more beneficial not to. Worrying about currency devaluation, the US financial mess, and future security. Deconstructing my carefully crafted new blog bit by bit until there was almost nothing left and then reconstructing it. Tearing my hair out over blog issues that are way beyond my level of competence. Inspecting every single line of my template for errors over and over again for two weeks, only to find out that it was a GOOGLE error in a standard gadget that was causing the problem! How's a blogger stand a chance between Google and MS Internet Explorer? A Honduran web designer who out of the blue offered to help me do something that Disqus told me couldn't be done! And it was done! So there, Disqus. Thanks, Rafael. You are an angel and a genius! God bless you for your kindness. Being able to flush the toilet. Being able to finish a load of laundry without having to clean out all the faucets in the house and run the washer empty first. People who miss me when I'm not online for days at a time. El Jefe, who shows amazing patience with my single-minded stubbornness. Anything in particular that strikes your fancy that you would like to hear more about? I updated my rainfall table for July if anyone is interested. We've been getting rain almost everyday, but mostly very light. It usually rains between about 4-6pm for a few minutes, hardly enough to register in the rain gauge. Often by the time I go around shutting windows on the east side of the house — the direction the rain almost always comes from — it has already stopped. I always think that it is perfect timing for the tourists: Beautiful sunny days and then a little rain around the time they are going back to their hotels to get ready to go out for dinner.